Rainforest Paradise in Far North Queensland. The first thing you notice when entering the lush rainforest world of Tropical Bliss B&B in Far North Queensland is the sound of rushing water and the deep umbrous green light of the rainforest. It’s a soothing sound, reminding me in many ways of Ubud in Bali. Tropical Bliss B&B sits high above Utchee Creek and just below the platformed gazebo, the rapids rush loudly. 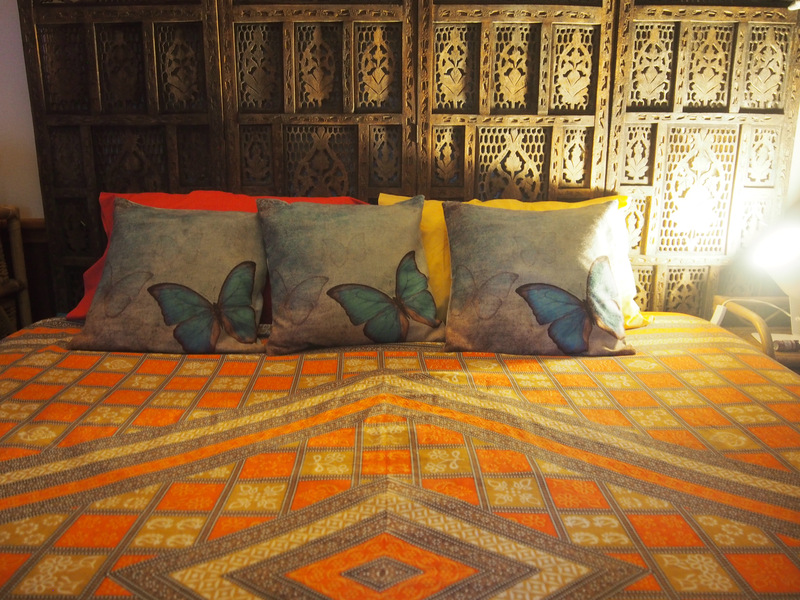 If you are lucky enough to stay in the Ulysses Butterfly room, you will feel totally immersed in this environment. It’s another world. The bedroom windows are flywired but open, the doors are French and best left ajar so you can hear the sounds of the night forest or the startling early morning chatter of the Wompoo fruit doves. An afternoon read is a luxurious pastime but it only takes a page or two before succumbing to that water world: the words blur and its off, once again, to the land of nod. Call them naps, or call them dreams or trance, they happen often here. Chillax, as the hosts say. Driveway into Tropical Bliss B&B. 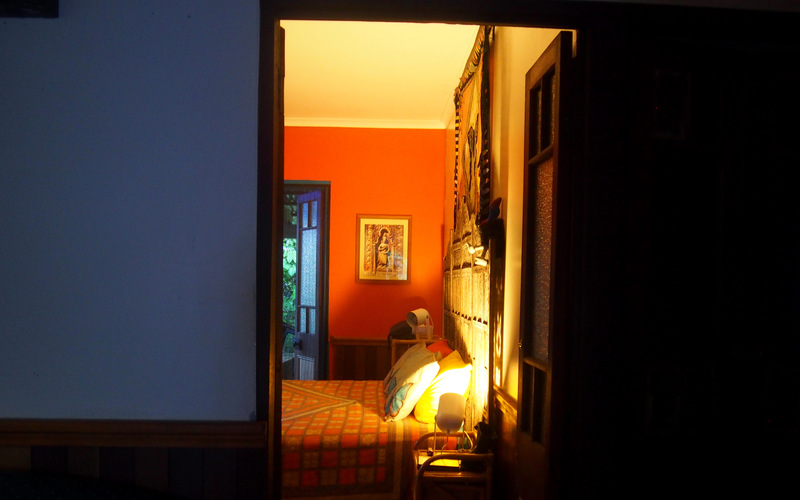 To get to Tropical Bliss B&B, drive south from Cairns down the Bruce Highway to the thriving country town of Innisfail, then head on through the sugar cane fields and banana plantations until you reach Utchee Creek. This is rich Queensland farming country but there are a few small settlements dotted throughout these fertile lands, especially along the creeks where the rainforest has historically been left intact. The rainfall in this area is the highest in Australia: it’s hard to imagine an average rainfall of 4,000 millimetres ( 160 inches) per year. The forest seems to grow before your very eyes. The thought of all this rain is quite overwhelming. The wet season continued later this year, with huge downpours throughout April, making Utchee Creek more teeming than usual. You can swim here- it’s too high for crocodiles. The small rock pools below look very tempting, though the staircase down is precipitous. Peter, the host, will happily guide you through his rainforest garden of 2.5 acres. Some is accessible and safe: other steeper sections along the creek are wild and primordial. Some plants have thrived here since the age of the dinosaurs. There are colours, shapes and textures unseen in safer southern lands and stories and legends abound. We passed one plant with incredibly sticky leaves: when torn, they have the property of super glue. Then there’s the Wait- a While stinging vine, ( the only way to become disentangled is to wait a while so you don’t get injured by the toxic stinging barbs) and then there’s Gympie Gympie, the devil- like bush with extremely painful and toxic leaves. Along the driveway, lush red flowers remind me of hydrangeas- they are beautiful but apparently invasive. Beyond, in a small grassy clearing, black bamboo canes soar above, while black sapote trees, strangler vines and pepper creepers compete for light. For those interested in tropical plants, Peter can give you a list of palms, ferns and vines in his garden. Research has been conducted on site by world-famous botanists who itemised around 20,000 plant species, including grasses and smaller microscopic plants. I was rather taken with the Zamea Furfuracea, or Cardboard Plant, a bush with thick leaves like sandpaper, good tucker for those ancient creatures from the mists of time. It’s a plant wonderland here. Peter can tell you about local activities, which might include a visit to Paronella Park, the Atherton tablelands, Mission beach, or the prosperous inland art deco town of Innisfail with its waterfront boats and fish shops. Perhaps you might be tempted to buy some fresh green tiger prawns or a slab of the beautiful white fleshed Coda fish or a coral trout? It is possible to buy some lovely produce in Innisfail to take ‘home’ to Tropical Bliss where you could use the BBQ or, by pre-arrangement, the kitchen. A chilled white wine or G&T in the rainforest, a bird call, and a pile of freshly cooked tiger prawns with a squeeze of lime is a pleasant way to spend the early evening. Otherwise, the nearby Mena Creek Pub serves meals. Peter offers a variety of breakfast options. He has just mastered the art of sourdough bread so expect some good toast and sugar-free tropical fruit jams, along with a tropical fruit platter and home-made yoghurt, or banana pancakes, eggs and a good coffee. Coffee and croissant on the deck. Huge tropical breakfasts at Tropical Bliss B&B. The house itself is an inviting open space, though most guests spend their time on the deck overlooking the jungle. Inside you’ll want to kick off your shoes and wander about in the shady lounge area, tastefully decorated in Graham Greene style, with wooden shutters, French doors and Chinese antiques. There are two tiny old dogs on site, both friendly and quiet, and the bathroom facilities are shared. 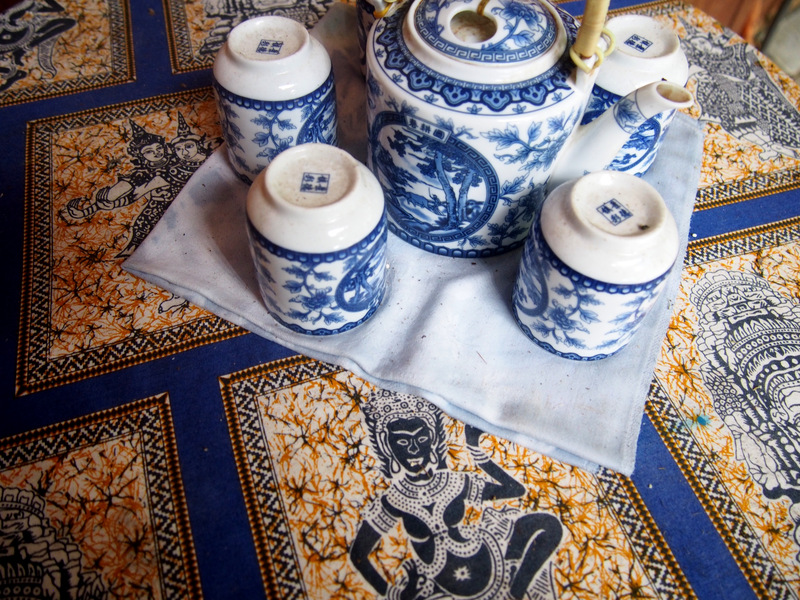 It is, in many ways, like a small and friendly guesthouse. Many ‘celebrities’ choose to stay here, given its private location, to recharge batteries and commune with nature. Some come to write, others to watch birds, backpackers to learn about Australia, and family groups come to have fun. There are two bedrooms and one overflow bunk room for children. Your hosts, Peter and Steve, can be as invisible as Ninjas or delightfully hands on and entertaining; it’s up to you. All you need to do is leave all your preconceptions behind. A short stay at Tropical Bliss is restorative and unique. Photo of Cassowary and chicks in the neighbourhood. Photo courtesy of Peter Dameaon. These chicks are now 30 months old and this male has cared for two more clutches since. I saw a Cassowary but I was too slow with the camera. I stayed at Tropical Bliss for 6 days, courtesy of the owners. The views expressed here are entirely biased, and I can honestly say, I loved it all. Contact me with any further queries or book through the usual channels or ring the owners via the link below. Posted on May 6, 2018 May 6, 2018 Author FrancescaCategories TravelTags Australia, birds, botany, country, Far North Queensland, guesthouse, Innisfail, jungle, Mena Creek, queensland, rainforest, tropical, Tropical Bliss B&B, tropical plants, Utchee Creek29 Comments on Rainforest Paradise in Far North Queensland. In my kitchen and its surrounding leisure zone, we are keeping warm as today’s temperature hovers between 2°C to 14°C. It will get colder. 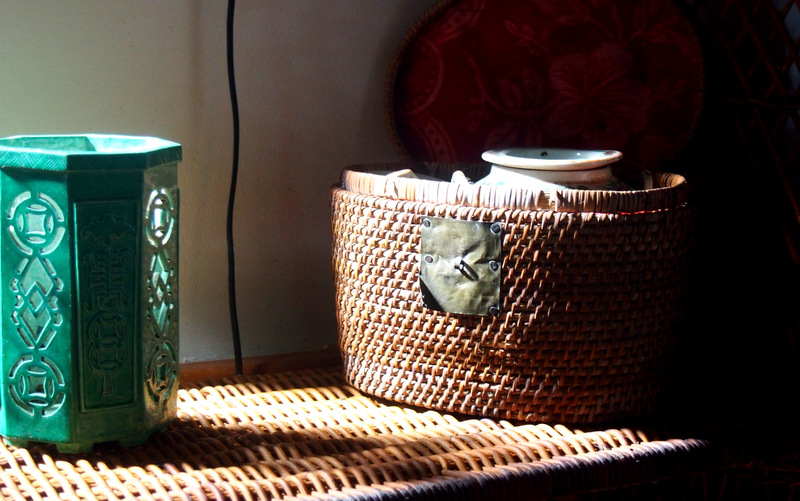 Spending more time indoors, mostly hanging around the old Huon pine table, means efficient heating becomes imperative. One early improvement we made to the kitchen and dining area was the installation of double glazing. This, more than any other home improvement, has been worth the cost. In this much lived in area, the windows face north with narrow overhanging eaves. The house, designed in the 1980s, incorporates some aspects of passive solar principles, whereby the low angle of the winter sun warms the room, with the reverse occurring in the height of summer. Nectre bakers oven. Australian made, efficient, radiant heat. Our new wood heater adds another layer of warmth and an appealing glow. Nectre heaters are Australian made and have a great reputation. This bakers oven heats a 10 square space very efficiently. Cooking stock on the top of the heater saves on gas. I look forward to mastering the use of the little oven. In this warm space, little vignettes of domesticity capture my attention, especially when a few strong shafts of light stream in. I find myself grabbing the camera more often, trying to capture that heavenly baroque light. That, or curling up on a sun bathed couch with a good book. Note that the new interloper, the clothes airer, has been edited out, along with the oversized kitchen table, now cluttered with a deluge of pastimes, paperwork and pencils. Drying out mandarin and orange peels on or near the wood stove fills the kitchen area with citrus fragrance. The dried peels make great firelighters. A large express postal bag arrived last week. Peter, who lives in Far North Queensland, sent me an assortment of tropical fruit he picked that morning. 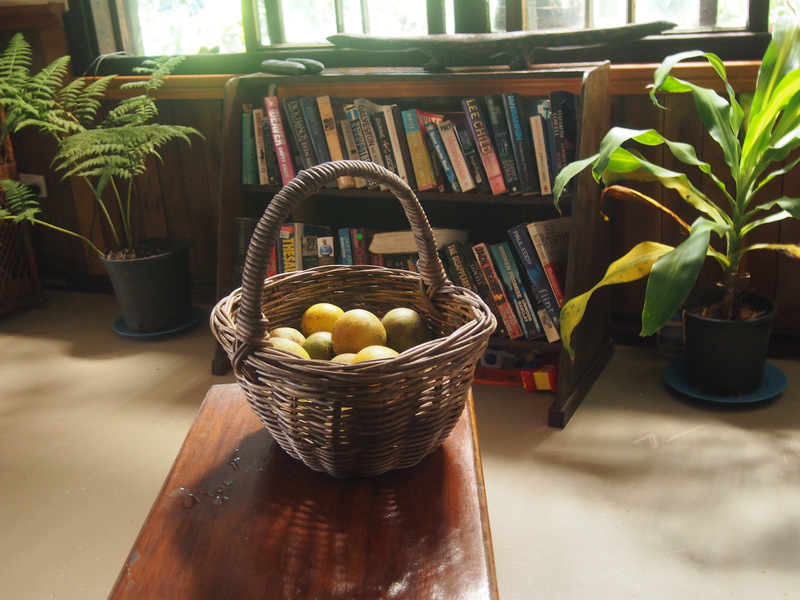 The slightly squashed papaya, the rambutan and mangosteen brought the heady perfumes of tropical rainforest to my kitchen. Peter also sent a swag of ginger, galangal and turmeric which grow in plague proportions in his yard. I’ve frozen most of these gems to make an authentic Indonesian curry in the future. Aromatics from Far North Queensland. Today I picked all the remaining borlotti beans from the garden. The first frosts of the year will arrive this week: all the green tomatoes need to be gathered and the lemongrass divided and potted up for winter. The borlotti beans prefer Autumn weather. They were sown in late February and matured slowly. I am very pleased with this year’s haul. Shelling borlotti beans, ruby jewels and scribbled gems, golden husks drying in the morning sun. There’s a stack of recently acquired cookbooks in my kitchen. To be truthful, there are little stacks of books everywhere in my house. Not mess, I’ll have you know. Decor and Inspiration! Some of these books were found at my favourite second-hand shop: My China by Kylie Kwong cost less than a copy of a weekend newspaper, as did Beverley Sutherland Smith’s The Seasonal Kitchen. Made in Italy by Silvia Colocca was a birthday gift from my sister. I bought Bourke Street Bakery online and am not finding it so useful, and Leanne Kitchen’s Turkey and The Baker also turned up somewhere very cheaply. Now I have to address the lack of bookshelf space. Some baby Roma tomatoes, the last of the season, ripen on the northern windowsill. A couple of second-hand items, a matching spotted jug and sugar bowl, found in that same second-hand store now hang out with the white stuff, shells, feathers and dead lizard on my kitchen dresser. As my friend Di would say, ‘Well spotted’. Blue polka dot jug and sugar bowl. Went for a song. Thanks Sherry of Sherry’s Pickings for hosting this monthly series. Your new system is working smoothly.